For the river called Laino, see Lao (Italian river). For the Calabrian municipalities, see Laino Borgo and Laino Castello. 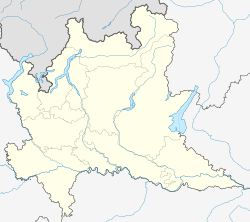 Laino (Comasco: Laìn [laˈĩː]) is a comune (municipality) in the province of Como in the Italian region Lombardy, located about 60 kilometres (37 mi) north of Milan and about 15 kilometres (9 mi) north of Como. Laino borders the following municipalities: Alta Valle Intelvi, Blessagno, Centro Valle Intelvi, Claino con Osteno, Colonno, Pigra, Ponna. Painter Livio Retti was born in Laino (30 November 1692). This page was last edited on 10 November 2018, at 10:04 (UTC).